Pisang Peak (6091m) located in Annapurna region offers good scope for exploration. The western flank of the mountain is guarded by a hanging glacier and offers considerable challenge. The western end of the ridge is guarded by huge rock slabs, which make it difficult to climb. A German Expedition made the first ascent of Pisang Peak in 1955. Asian Hiking Team a well organizer for Pisang Peak climbing with all necessary documents, permits, equipements and experience climbing Sherpa and camping managements. Trekking into Pisang peak base camp start from Besi sahar however now a day busable road to Chame and one day hiking to Pisang. A full day explore in upper pisang the contines walk to Pisang peak base camp. After Summit, either return from same way or continues trek to Thorong-la pass and take flight or drive from Jomsom or trek to Nayapul. Our itinerary start from Besi Sahar and end your trek in Jomsom than fly or drive to Pokhara. A German Expedition made the first ascent of Pisang Peak in 1955. Day 02: Kathmandu city sightseeing and preparation for climbing, meet staff and briefing. Day 03: Kathmandu – Besi Sahar by Bus then transfer to Tea House Lodge. Day 04: Benshi Sahar – Jagat. 1,314m. Tea house /Lodge. Day 05: Jagat – Dharapani. 1,943m. Tea house /Lodge. Day 06: Dharapani – Chame. 2,713m. Tea house /Lodge. Day 07: Chame – Pisang. 3,185m. Tea house /Lodge. Day 08: Pisang – Pisang Peak Base Camp, Tented Camp. Day 09: Pisang Peak High Camp, Tented Camp. Day 10: Early morning climbing the Pisang Peak (6,092m.) back to Base Camp. Tented Camp. Day 11: Spare day for climbing. Day 12: Pisang Base Camp – Ghyaru 3,673m. – Manang Village 3,500m, Tea house Lodge. Day 13: Manang – Thorung Phedi 4450m. Tea house/ Lodge. Day 14: Thorung Phedi – Thorung – La Pass. 5,416m. – Muktinath. 3,800. Tea house/ Lodge. Day 15: Muktinath – Jomsom 2713m, Tea house/ Lodge. Day 16: Jomsom – Pokhara by flight or drive by jeep. Day 17: Pokhara – Kathmandu by tourist Bus then transfer at Hotel. Day 18: Last minute, transfers to airport for your onward journey or next trip. Annapurna Conservation fees or permission. Day 01: Arrival in Kathmandu airport, meet our staff then transfers to Hotel (BB). Day 02: Kathmandu city sigh seeing and preparation for climbing, meet staff and briefing (BB). Day 03: Kathmandu – Beshi Sahar by Bus then transfer to Tea House Lodge B/L/D). Day 04: Benshi Sahar – Jagat. 1,314m. Tea house /Lodge B/L/D). Day 05: Jagat – Dharapani. 1,943m. Tea house /Lodge B/L/D). Day 06: Dharapani – Chame. 2,713m. Tea house /Lodge B/L/D). Day 07: Chame – Pisang. 3,185m. Tea house /Lodge B/L/D). 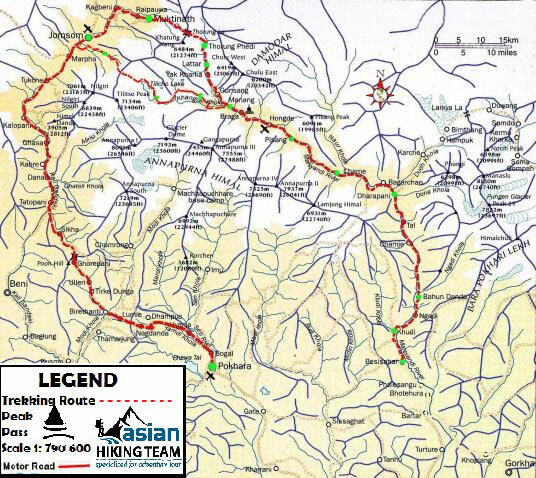 Day 08: Pisang – Pisang Peak Base Camp, Tented Camp B/L/D). Day 09: Pisang Peak High Camp, Tented Camp B/L/D). Day 10: Early morning climbing the Pisang Peak (6,092m.) back to Base Camp. Tented Camp B/L/D). Day 11: Spare day for climbing B/L/D). Day 12: Pisang Base Camp – Ghyaru 3,673m. – Manang Village 3,500m, Tea house Lodge B/L/D). Day 13: Manang – Thorung Phedi 4450m. Tea house/ Lodge B/L/D). Day 14: Thorung Phedi – Thorung – La Pass. 5,416m. – Muktinath. 3,800. Tea house/ Lodge B/L/D). Day 15: Muktinath – Jomsom 2713m, Tea house/ Lodge B/L/D). Day 16: Jomsom – Pokhara by flight or drive by jeep, overnight at hotel B/L/D). Day 17: Pokhara – Kathmandu by tourist Bus then transfer at Hotel (BB). Day 18: Last minute, transfers to airport for your onward journey or next trip (BB).